Well Happy September to you all! I hope you are enjoying the back to school routine and the crisper air. I know I just feel more “together” once the randomness of summer comes to a close and my life is back on a schedule. Fall!! Is there a better season? I know it’s not officially fall yet but I have already been burning pumpkin spice candles and placing a few little pumpkins throughout my home. I just recently made a few changes in my family room and have been itching to share them with you. For me, at least, refreshing a room involves ordering a few new items and then anxiously waiting for them to arrive. I wanted to share my family room with you a lot sooner, but I thought I should wait until it was complete. I just changed a few things, but these little changes made all the difference in the world and really gave the room a whole new, fresh look! Here is a “before” picture of our family room. The farmhouse coffee table was a decor show find, and we used it for several years. It is very cute, with turned legs and a rough plank top. Lately however, it just hasn’t given the room what it has really needed, which is a more modern farmhouse vibe. Soooo, I took the liberty of ordering a new one (thank you again, Jaime!). I’m sure a lot of you know what I mean when I say that our decor styles slowly evolve and change over time. That’s the fun of design and decorating–you don’t have to “fix” your decor and keep it the same way forever. There will be new designs and trends out there that will inspire you–that will challenge your style a bit. And that’s a good thing! We need change–we need something new to look at eventually. I think Joanna Gaines really inspired me to bring more “modern” into my farmhouse style. I just love the look of a modern piece next to an older piece–the contrast is striking. The older pieces stand out against the newer pieces, and vice versa. It just keeps your home looking fresh and prevents it from turning into a museum. Well, here is a first look at our newly refreshed family room! Let’s start with the rugs. I ordered our 8×10 here, and the 4×6 here. I love that the braided wool 8×10 rug adds a lot of texture to the space yet is still quite soft. Let the wrestling matches begin! And I love the neutral ivory color–it just goes with anything. You really can’t go wrong with this rug. I really like the idea of layering rugs for more texture and visual interest, so I decided to anchor the coffee table with this striped neutral jute 4×6 rug. The darker, yet natural color of this rug contrasts perfectly with the ivory and keeps the floor from looking like a “sea of white.” It just looks like these two rugs were meant to go together, and they bring a whole new dynamic to the space. I am absolutely in love with this new coffee table! It is more modern compared to the farmhouse table, which was exactly what I was looking for, and is the perfect addition to any family room. I like that is has a rather modern profile yet the beautiful wood planks give it a rustic feel. This particular table is made of solid wood and is reasonably priced. I highly recommend it! On my slipcovered sofa, I added a couple neutral striped pillow covers I found on Etsy, and also swapped my “home” pillow for this neutral paisley lumbar pillow I had in my living room. I added a few neutral pumpkins and this sweet candle lantern from Hobby Lobby to my Magnolia coffee table tray. When it comes to decorating for Fall and Christmas, I’m all about “less is more.” I keep my seasonal decor neutral, natural and minimal, as I feel that simple yet intentional decor makes a bigger statement than a plastering of orange pumpkins, bats, scarecrows, and witches in every room. That look just isn’t me, and orange just doesn’t fit my home’s color palette–you know what I mean? Here is the view of the other side of our small family room. We’ve had our Ikea entertainment center for a couple years now, and we just love it. I like that it provides lots of storage and shelving to display baskets and other decor. Because it is such a boxy, simple piece, we added a strip of crown molding to the top to dress it up a bit. This entertainment center is from the Hemnes line, and you can pretty much custom build your own unit with the various sized pieces that Ikea offers. I added some simple cotton stems to the top of the entertainment center in cute containers to add a little more fall to the room. One of the containers is nestled in an antler shed, which I love. 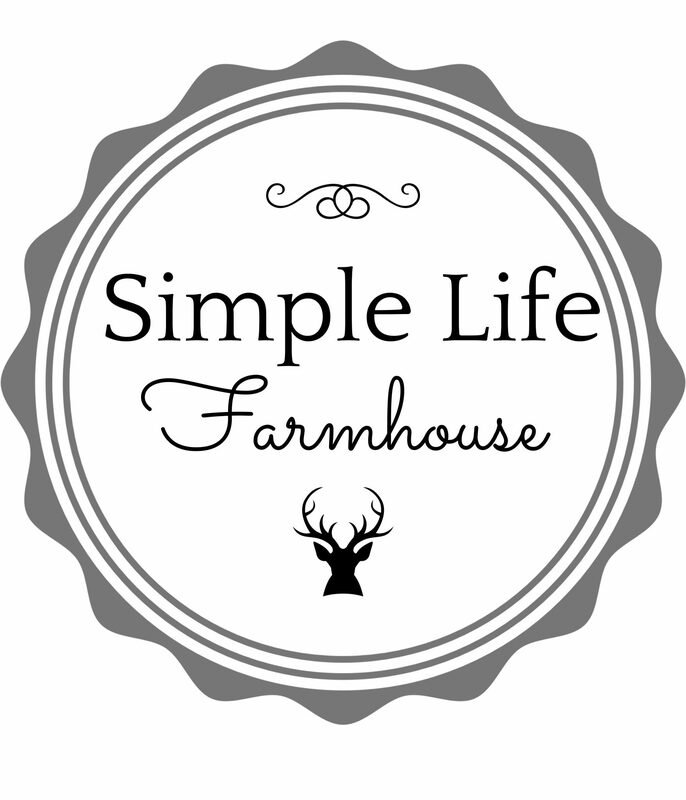 I like the rustic feel that antlers bring to a modern farmhouse, and have a few antlers and deer head images throughout my home. That reminds me, I haven’t mentioned anything about our antler chandelier yet, which is a huge statement piece in our family room. We’ve had it for several years now, and I am pretty sure we ordered it from Cabelas. It’s a fun piece, and like I said, it just gives the room a little bit of a rustic feel. It stands out beautifully among the modern pieces. Well, I hope you have enjoyed visiting my family room! I certainly have enjoyed sharing it with you and hope I have given you a few ideas to play with as you make changes to your own home. Enjoy decorating for fall too! I’ll be sharing my living room fall decor in my next post. God Bless!